If you’ve been contemplating how to get more nutrition while consuming less calories, you’re not alone. The average American is said to need an approximate 2000 calories depending on their height, gender, and physical activity levels. But the reality is that individuals consume much more than this, and the foods making up these calories are certainly not on a ‘healthy’ level most of the time. 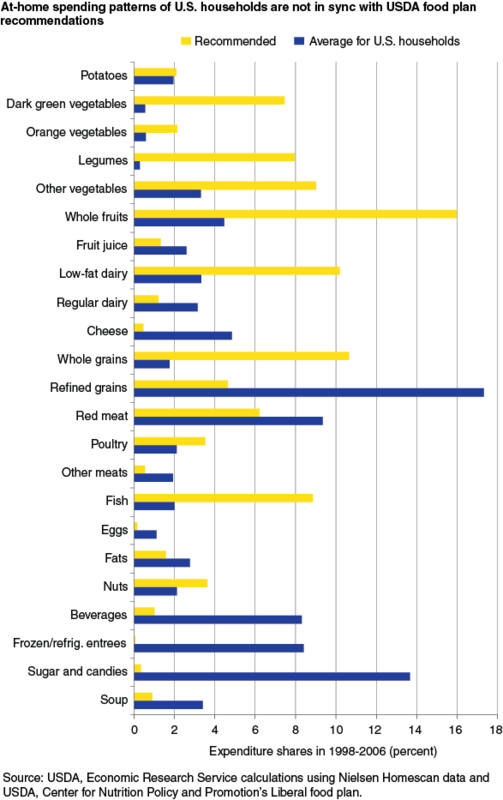 The chart below from the USDA’s Amber Waves publication shows the US customer’s average spending plan on food, with yellow being what is recommended, and blue what American’s actually purchase. Americans should be eating more fruits, vegetables, legumes, whole grains, and nuts, but they tend to eat refined grains (meaning white flour) and sugar and candies, as well as frozen fast-food entrees the most. Since we obviously have a bad habit, it’s usually easier to start with small changes to fix it. This great salad green is a bit spicy, and a far cry from where flavor is concerned. It also contains much more nutrition than other lettuce varieties. Arugula is only 4 calories per cup and is high in Vitamins A, K, and C, and also contains potassium and fiber that keep you hydrated and also full. Try saying that about a Big Mac or a Whopper. The spear-veggie asparagus tastes delicious grilled with a little lemon and pepper. You can also opt for just barely steamed asparagus to get the most nutrients from it. The vegetable contains only 27 calories per cup, along with important minerals, as well as Vitamins A, C, E, K, B6, and folate. Asparagus also flushes excess fluids from your body, while MSG-laden fast foods keep you bloated. Try getting anti-cancer properties out of a large soda, or a sports drink. You can’t. Green tea; however, has tons of phytonutrients, and helps to stabilize blood sugar. Sugary sweet colas and sugar-laden sports or energy drinks not only cause your blood sugar to spike, but also cause you to crave more salty and sweet foods. Green tea leaves are not processed like other tea leaves, so they are full of catechins, too, which help to reduce inflammation in the body and speed weight loss. Oh, and there are only 2 calories in a mug of green tea. Compare that to an average 182 in a medium soda. Green tea is also a great liver detox food. Coffee drinkers may be at lower risk of liver and colon cancer, Type 2 diabetes, and Parkinson’s disease. What’s more, the morning beverage may help you live longer than those who drink soda. A 2008 study found that women who drank coffee regularly—up to six cups a day—were less likely to die of various causes during the study than their non-coffee-drinking counterparts. Broth is a savory start to almost any soup you can imagine. You can add brown rice, other nutritious vegetables, whole, unrefined grains, and even seaweed (another super food). Depending on the type of broth you make, it will contain important nutrients your body needs. Additionally, many traditional broths contain alliums like onions and ginger, which help to prevent colds and keep your energy up. A broth base to a dinner or lunch is only 100 calories. A small bowl of chili from Wendy’s contains twice as many calories, and 780 mg of sodium. You can prevent breast cancer and get tons of Vitamin C and folate by eating this super food. There are only 3 calories in one cauliflower floret, so even if you doused yours in organic olive oil and sea salt and pepper, you’d still be ahead compared to eating a small serving of fries from McDonald’s. Those contain 230 calories. Try this cauliflower baked fries recipe instead. From Reishi, Shiitake, Oyster, and Portobello, to a dozen other varieties, mushrooms are a nutritional powerhouse for only round 15 calories per cup. Just about every variety of mushroom contains loads of antioxidants, and some have ‘super healing’ properties which propel the food to the top ten food lists of Chinese medicine practitioners. Shiitake can fight cancerous tumors; white mushrooms can prevent prostate cancer; Maitake mushrooms are great for anyone wanting to prevent breast cancer; and Porcini mushrooms are super anti-inflammatory. It’s not unusual to see calorie counts of 600 or more per cup of grain. This is a lot, especially if you’re struggling to keep your calorie consumption in check. Hominy and oat bran are both low calorie, unprocessed grains that can make any meal more satisfying while providing high nutrition. Yellow hominy has about 130 calories per cup. Oat bran, which can even be substituted for white flour in baking recipes, has only 87 calories per cup. This super food is great for vegetarians or those who want to consume less red meat. In just one cooked cup you’ll get 8 grams of complete protein, 5 grams of fiber, iron, manganese, and other nutrients at around 220 calories. Compare this to a fast food burger, and you’ll understand why it’s a good substitute. Though you can purchase a Whopper Jr without mayo and get around the same amount of protein and calories, you won’t get nearly the same nutrients – plus 460 mg of unwanted sodium. This brings us to the piece de resistance – the substitute for all the processed sugar and candy Americans like to eat. If you have to satisfy that sweet craving, why not get some super nutrients in the process – and for far fewer calories than many of the desserts offered in the SAD (Standard American Diet, and yes it is sad.) Organic, dark chocolate-covered strawberries, for instance, have tons of Vitamin C, calcium, and iron. Strawberries alone have just 49 calories per cup. Dark chocolate has also been shown to reduce body fat.